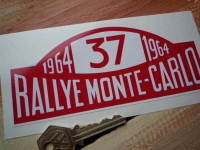 A reproduction of the sticker produced to celebrate the victories in the Monte Carlo Rally's. Machine cut to rally plate shape, the gold background you can see is backing paper and is not part of the sticker. Choose from 1964, 1965, or 1967. 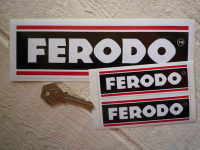 Available as either a regular sticky backed Vinyl sticker for use on the outside of a cars bodywork, toolboxes, etc. Or as a lick'n'stick style Static Cling sticker, designed for use on the inside of a window facing outwards and repositionable. 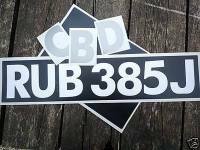 Sticker measures approximately 150mm x 68mm. 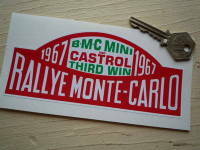 BMC Rosette Stickers. 2" or 4" Pair. 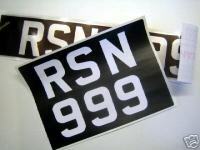 British Leyland Blue & Red Helmet Stickers. 2.5", 4", 6" or 9" Pair. Britax Waisted Yellow & Check Stickers. 4", 5.5", 8", 10" or 12" Pair. 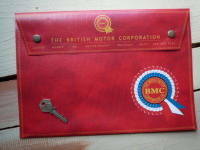 BMC Rosette Static Cling Sticker. 4". 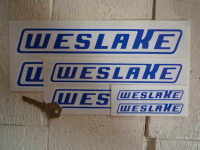 Weslake Slanted Oblong Logo Stickers. 2.5", 4", 6", 8" or 10" Pair.